The first span of the Interstate Bridge opened in 1917. It was the first automobile bridge between Oregon and Washington. Much later, in 1958, the second span was built. The original span now serves to convey traffic north into Vancouver. The bridge was designed by J.A.L. Waddell who also designed Portland’s Steel and Hawthorne bridges. But the bridge was not designed just for automobiles. Streetcar tracks and five foot sidewalks were installed as well. 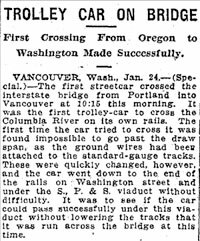 The bridge opened to the general public on February 15, 1917, but on January 24, 1917 a streetcar made a trial run across the bridge, making it the first trolley car to cross the Columbia River on rails. Streetcars traveled regularly between Vancouver and Portland, across the Interstate Bridge, until 1940.